Thermodynamic Solar Panels the most advanced hot water renewable technology available for domestic homes in the United Kingdom today. Thermodynamic solar energy converts energy all day and night creating constant hot water for domestic hot water. Thermodynamic Solar Panel System can save over 75% of you hot water needs all year round. Absolute Solar is working with Energie, installing is full ECO range of domestic hot water systems using renewable 24/7/365 hot water systems. Available in system capacities of between 200 to 500 litres, to provide renewable solar hot water to domestic homes with systems with one or two solar panels, we can install a suitable system with piping hot water for one person to six living in a house. Heating water is one of the most costly elements in household bills, so this new exciting technology provides continual, all day, all weather hot water. Once the gas in the Thermodynamic Solar Panel vaporises, it passes down to a very small compressor located near your water cylinder. The gas will vaporise and release its heat which then transfers to your hot water via a heat exchanger. Once the heat has been released then the refrigerant gas becomes cold, is compressed and returns to the solar panel and the process starts all over again. Typically the thermodynamic solar panel is roof fitted, but can be wall mounted and is ideally suited to British weather conditions. Thermodynamic Solar Energy works 24/7 every day of the year to vaporise a very cold inert refrigerant gas that flows through the solar panel. What this means, no matter what the British weather is doing you can produce 100% of your hot water from a single of dual panel system. Lower overall running costs than other systems, with no maintenance. Compared to traditional solar panels Energie Thermodynamic Solar Panel systems provide energy to heat water all day and night, every day of the year. This contrasts with traditional Solar panels which only work during daylight hours and are affected by the quality of direct sunshine. The technology within Thermodynamic Solar Panel Systems works down to air temperatures of -15 degrees celsius and does not require a large surface area of uninhabited south facing roof to generate renewable energy, unlike solar thermal panels. 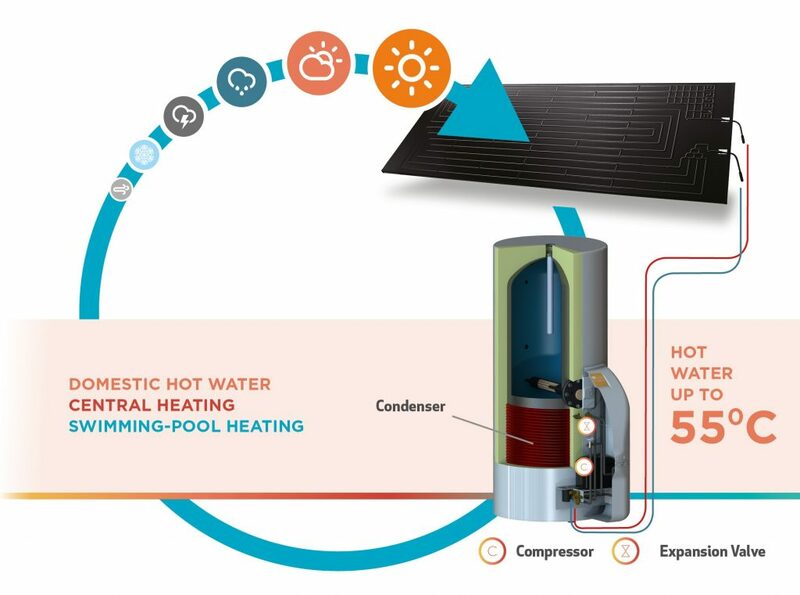 Thermodynamic Solar Panel Systems do utilise heat-pump technology coupled with a secondary immersion coil to raise hot water temperatures above 55 degrees centigrade as required. Thermodynamic Solar Panel Systems offers lower overall running costs than other solar products with better guaranteed performance. Typical annual running costs of a Thermodynamic system are around £180 per year compared to £1,138 a year for a typical British house according to Ofgem. Energie have been manufacturing this technology for almost 30 years, in Portugal. They have a world-wide distribution network and invest heavily in continually improving the product. 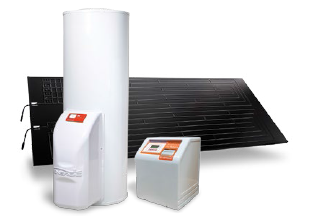 The Eco range of domestic hot water systems provides customers with 3rd generation Thermodynamic solar energy, providing efficient, low cost and long life completely renewable technology ideally suited to the British Climate. With Models from 250 litres through to 500 litres the Eco range is ideally suited to domestic installations and fits with Absolute Solars ethos of tried and tested world class renewable technologies for our customers. 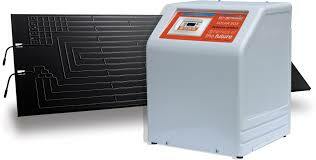 Absolute Solar are delighted to be an approved installer of Energie Thermodynamic Solar Energy Eco Range Systems. Absolute Solar has been approved and trained to design and install the right solution Thermodynamic solution to customers. This turnkey solution ensures that customers get complete support from Absolute Solar thought the process of design through to install and commissioning their Thermodynamic Energy System for their home. Or to contact us now click this link Contact Absolute Solar or call us on 0800 652 377 to speak to our Thermodynamic Solar Energy Experts.